Although it is a slightly slower growing shrub it is very rewarding when used in a garden. It reaches around 30-50cm in height and has a sprawling growth habit. 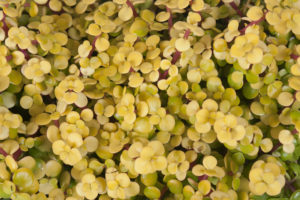 It has bright yellow, rounded succulent leaves and a reddish stem. This Portulacaria grows best in the sun but will cope in semi-shade conditions, the colour of the leaves being brighter if sun grown. Portulacaria is not fussy about the soil it is grown in, but does prefer that the soil drains well. It is coast friendly, drought tolerant and water wise. Do not overwater or plant in clay soils as this will cause the plant to rot. In its natural habitat small pink flowers appear in the spring months , unfortunately in cultivated plants these are not often seen , for gardening purposes the plant is used more for its striking leaf colour and water wise attributes. Portulacaria is generally suited to all areas of SA but is not ideal in heavy frost areas. Being a Spekboom the leaves are edible and of course it is a marvellous carbon collector. It is also classified as a soil binding plant and is excellent for the control of soil erosion. Portulacaria afra ‘Aurea’ is an easy to grow low maintenance plant. It works well in hot dry rockeries or planted with other succulents when water is scarce. At the same time it will happily provide bright evergreen leaf colour amongst plants which receive regular water.